If you’re like many people, you might not even know where Jordan is on a map, let alone ever considered traveling there. Petra may look familiar to you if you’ve seen “Indiana Jones and the Last Crusade”, but this small country has many other incredible places to see and is rich with culture. 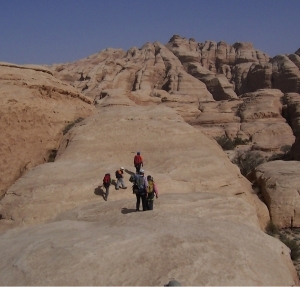 Geosciences Professor Dr. Tom Paradise has been studying Jordan for over 25 years. Engaging Cultures Travel had a chance to sit down with him and ask this question: “Why visit Jordan?” Click the video below to see what he had to say. Interested in taking a Jordan tour? Contact us by clicking here and we’ll set you up with a free, customized itinerary and tour quote, or get some off the beaten path inspiration for your Petra tour by clicking here.